(Phys.org)—Researchers have found that a snowflake-like fractal design, in which the same pattern repeats at smaller and smaller scales, can increase graphene's inherently low optical absorption. The results lead to graphene photodetectors with an order-of-magnitude increase in photovoltage, along with ultrafast light detection and other advantages. The researchers, from Purdue University in Indiana, include graduate students Jieran Fang and Di Wang, who were guided by professors Alex Kildishev, Alexandra Boltasseva, and Vlad Shalaev, along with their collaborators from the group of Professor Yong P. Chen. The team has published a paper on the new graphene photodetector fractal design in a recent issue of Nano Letters. Photodetectors are devices that detect light by converting photons into an electric current. They have a wide variety of applications, including in X-ray telescopes, wireless mice, TV remote controls, robotic sensors, and video cameras. Current photodetectors are often made of silicon, germanium, or other common semiconductors, but recently researchers have been investigating the possibility of making photodetectors out of graphene. Although graphene has many promising optical and electrical properties, such as uniform, ultra-broadband optical absorption, along with ultra-fast electron speed, the fact that it is only a single atom thick gives it an intrinsically low optical absorption, which is its major drawback for use in photodetectors. 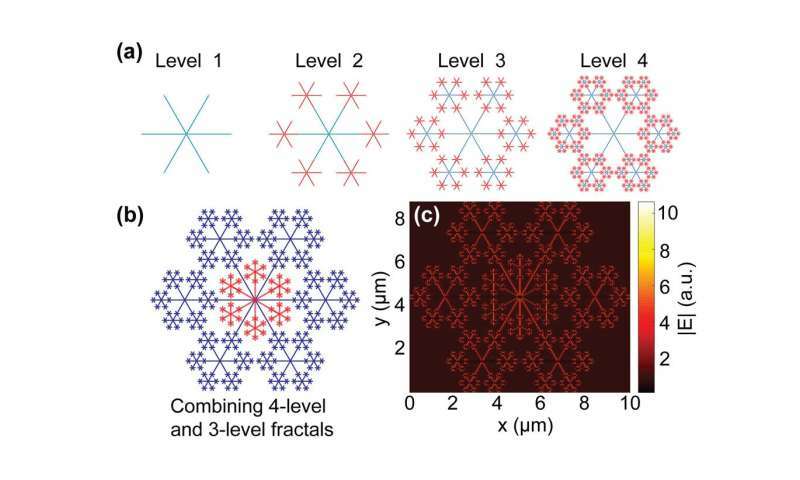 To address graphene's low optical absorption, the Purdue researchers designed a graphene photodetector with gold contacts in the form of a snowflake-like fractal metasurface. They demonstrated that the fractal pattern does a better job of collecting photons across a wide range of frequencies compared to a plain gold-graphene edge, enabling the new design to generate 10 times more photovoltage. The new graphene photodetector has several other advantages, such as that it is sensitive to light of any polarization angle, which is in contrast to nearly all other plasmonic-enhanced graphene photodetectors in which the sensitivity is polarization-dependent. The new graphene photodetector is also broadband, enhancing light detection across the entire visible spectrum. In addition, due to graphene's inherently fast electron speed, the new photodetector can detect light very quickly. "In this work, we have solved a vital problem of enhancing the intrinsically low sensitivity in graphene photodetectors over a wide spectral range and in a polarization-insensitive manner, using an intelligent self-similar design of a plasmonic fractal metasurface," Wang told Phys.org. "To our knowledge, these two attributes were not achieved in previously reported plasmonic-enhanced graphene photodetectors." The researchers explained that these characteristics can be directly attributed to the fractal pattern. "Our proposed fractal metasurface has the unique ability of supporting plasmonic resonances (free electron oscillations) over a wide spectral range in a polarization-insensitive way due to its complex and highly hexagonally symmetric geometry," Kildishev said. "Previously reported plasmonic-enhanced graphene photodetectors use simpler narrowband and polarization-sensitive structures, and therefore the enhancement is also narrowband and polarization-sensitive." As previous research has shown, the reason that a fractal pattern can improve optical absorption is that the fractal metasurface creates additional resonances, with the amount of resonance increasing as the number of fractal levels increases. In addition, the researchers here found that the fractal metasurface confines and enhances the electric field of the light that hits the surface. This ultimately leads to a higher photovoltage generated in the graphene photodetector. As Kildishev explained in more detail, there are two major mechanisms of inducing photovoltage in a graphene-based photodetector: the photovoltaic effect and the photothermoelectric effect. The photovoltaic effect uses the built-in electric field induced by differently doped regions in graphene to separate the optically excited electron hole pairs in graphene. The photothermoelectric effect drives the free electrons in graphene across regions with different thermoelectric powers (Seebeck coefficients), given a temperature gradient in between the two regions. The fractal metasurface enhances both effects in graphene photodetectors by increasing the electric field intensity and by heating via incident light in highly confined spaces. 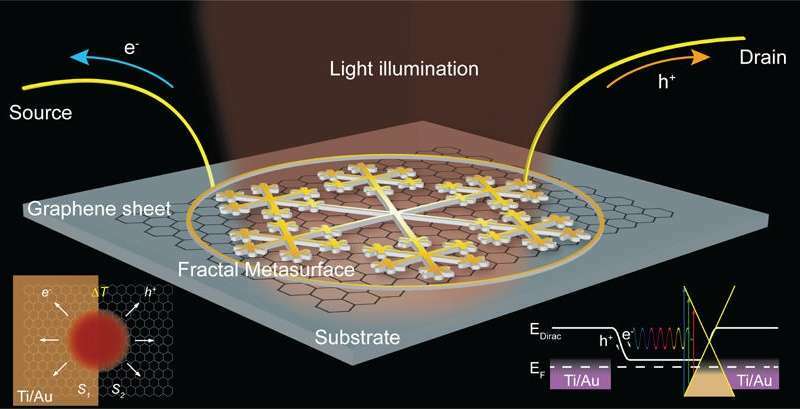 "The fractal metasurface enhances the photovoltage by making use of plasmonic resonance—free electron oscillations in gold under the excitation of light," Kildishev said. "This then confines the electromagnetic energy to ultra-small volumes, generating excessive electron-hole pairs in graphene which are then separated by the photovoltaic effect. The incident light also heats up the plasmonic structure to create a large temperature gradient across the metal/graphene interface, giving rise to a stronger photothermoelectric response." In the future, the researchers plan to explore the potential applications of graphene photodetectors, which could extend beyond photodetection to photoharvesting, with applications such as solar cells and optical heating. Technologies that require a fast response could also experience significant improvements due to the graphene photodetector's fast operation speed. "One great attribute of the graphene photovoltaic/photothermoelectric detector is that it reacts to light at an extremely fast rate, thanks to the ultrafast electron moving speed (photovoltaic effect) and the ultrashort time the electrons need to give away heat (photothermoelectric effect) in graphene," Wang said. "Such response speed is unparalleled by other photodetection materials. "Plasmonic enhancement has been known to sacrifice the ultrafast response speed to a minor extent. Therefore, plasmonic-enhanced graphene photodetectors are promising for all-optical modulator readout and other applications where response speed is key. Moreover, graphene has zero (or tunable) bandgap and uniform optical absorption in the entire electromagnetic spectrum. Therefore, graphene photodetectors can in principle be used to detect light of any frequency with identical sensitivity, which again is unparalleled by other detectors made of other photodetection materials."